Getting a new Follower is great, but wouldn’t it be better if you could automatically get more information about them from across the web? You can! Below I’ll describe the process I use to generate enhanced Twitter follower notifications. 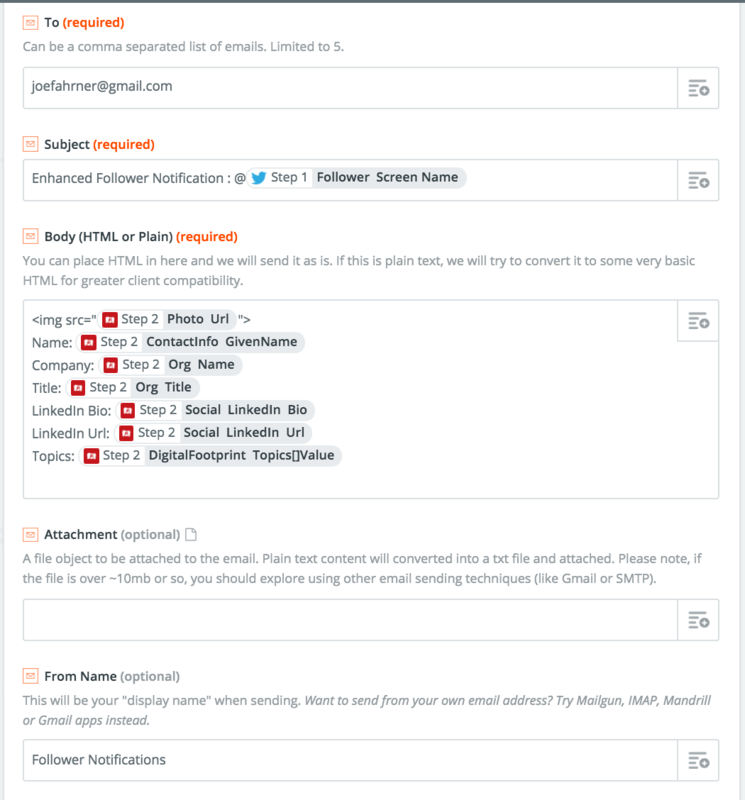 It users Zapier, a killer web service automation tool to connect Twitter and Fullcontact so that every new follower that I receive on Twitter triggers a email with more details on that account. This includes things like company name, title, a phote, LinkedIn account information and more. It case you are not familiar with Fullcontact, the company offers an API for contact enrichment. Given an input, like an email address, full name or Twitter handle, Fullcontact can potentially provide dozens of additional bits of information about the owner. A Fullcontact developer account: your first 500 API matches are totally free to start. You’ll need to upgrade to a paid plan when you exhaust those. The lowest cost paid plan is Starter which costs $99 per month and gives you 5,000 matches. This should be more than enough for most twitter accounts. Signup for your Zapier Basic, Fullcontact and Twitter accounts if you don’t already have them. You’ll be prompted to select a “trigger” app. Select Twitter and then select “New Follower” as your trigger. It is at the very bottom of the list. You’ll be prompted to connect your Twitter account to your Zapier account. 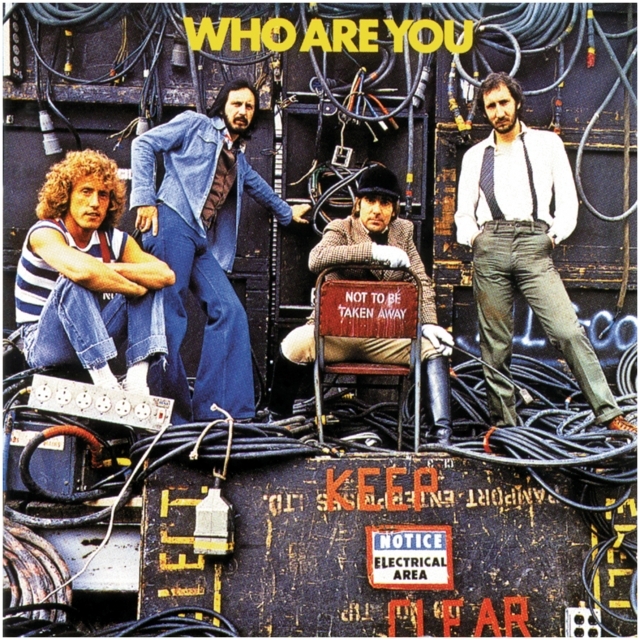 You’ll be asked what Twitter username you’d like to monitor for new followers. Enter your Twitter @handle into the field. Once that is complete, you’ll be able to test that the integration is working as expected. Next you’ll add a second trigger app. 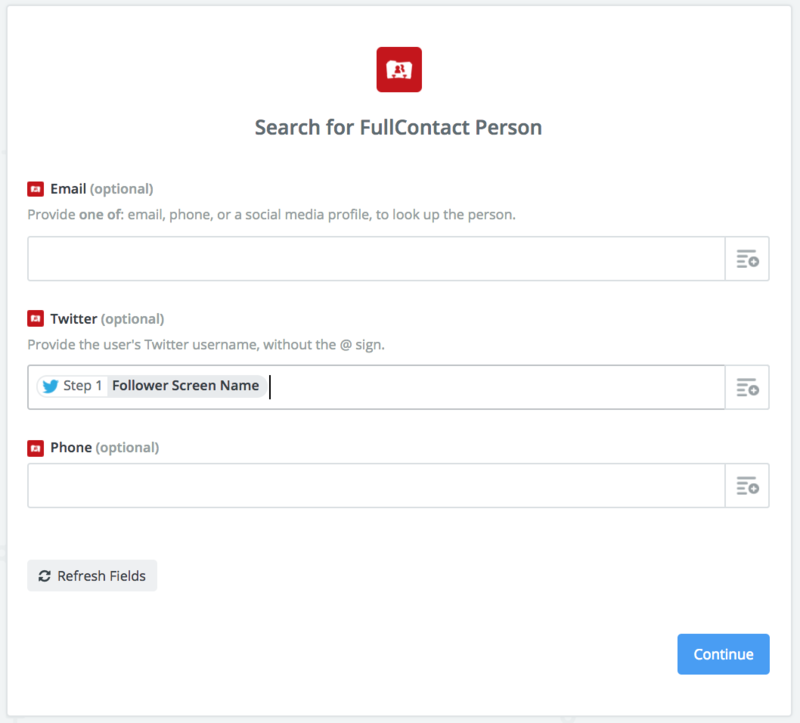 Choose Fullcontact and then select “Find a person” as your action. You’ll be prompted to provide your Fullcontact access token in a pop up window. You can find you access token by clicking here (you’ll need to be logged in to your Fullcontact account). Now you’ll add your action step. In addition to integrating with hundreds of third party apps, Zapier has several useful “built-in” apps. One of these is called “Email”. We’ll use this to have Zapier automatically email you new follower details from Fullcontact, so select Email from the select app screen. Next you’ll create the actual email template which populates fields from the Fullcontact API response and configure the details of the email. Here are the settings that I used for this example: If you follow the configuration above your receive an email that includes an image of your new follower, their name, company, title, LinkedIn bio, LinkedIn URL and a list of “digital footprint topics”. These are keywords and phrases that reflect the types of things that this person is associated with based on their social presence. It is missing from the screenshot above, but make sure you select “Yes” in the “Force linebreaks?” drop down at the bottom of the page. This will improve the readability of your notifications by putting each data point on a new line. Finally, Zapier will walk you through a test of the email send so that you can see what it looks like in your inbox. Once you’re happy with the output you can name and launch your zap. Once you’ve launched your zap it’ll just run in the background. There is no ongoing maintenance to worry about. But, you may want to try out different fields or email structures. Fullcontact has dozens of fields available in their API response that you can use to populate your enhanced Follower notification emails. Fullcontact data is good but not perfect. You’ll likely see some inaccurate data or empty fields from time-to-time. Regardless of some misses and gaps, I find these additional insights very useful. Zapier integrates with hundreds of applications, so you can replace the email step with something else if you like. For example, populate the new Follower data into a Google spreadsheet, an Evernote note or send it to your CRM system.